Roberto Visani is a multi-media artist residing in Brooklyn, New York, he is also a faculty at John Jay College of Criminal Justice. He received an MFA from the University of Michigan in 1997 and a BFA from Minnesota State University, Mankato in 1994. 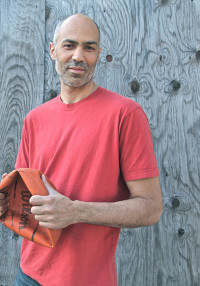 He has exhibited his work internationally at such venues as the New Museum of Contemporary Art, NY; The Studio Musuem in Harlem, NY; Yerba Buena Center for the Arts, San Francisco, CA; The Contemporary Arts Center, Cleveland, OH; Barbican Galleries, London, UK; and the Ghana National Museum, Accra, Ghana. He has been an artist in residence at the Lower Manhattan Cultural Council, NY; Atlantic Center for the Arts, FL; and The Cooper Union, NY. He is a past Fulbright scholar and a 2007 recipient of a New York Foundation for the Arts fellowship in sculpture.